SART is Search And Rescue Radar Transponder. The purpose of SART is to determine the location of Survivors during search and rescue operation. Every vessel is equipped with 2 SARTs located in a easily accessible place, normally bridge, which are to be hand carried to life rafts/life boats while abandoning the vessel. They are to be mounted on the survival craft as high as possible at least one meter above the sea level, with help of telescopic rods and left ON in stand-by mode during emergencies. SARTs are designed to work with X band radar (3 CM/9Hz radar). Whenever the SART is intercepted by a X band radar signal from any approaching vessel or aircraft, it automatically transmits signals which will appear as 12 blips on the Radar screen (PPI), enabling to find range & bearing. As the vessel approaches the position of SART and when the range is approximately 1 mile they will change to arcs and become circle when very close to SART position. When interrogated by an X band radar signal, SART gives a audible beep sound every 2 secs and visual indication. The range of SART is 10 nm to large ships and 40 nm to SAR helicopter at a height of 3000ft when mounted 1 m above sea level. To enable to identify SART X band radar are set for use 12 nm. SART is to be checked once a month by putting the X band radar on 12 miles range. 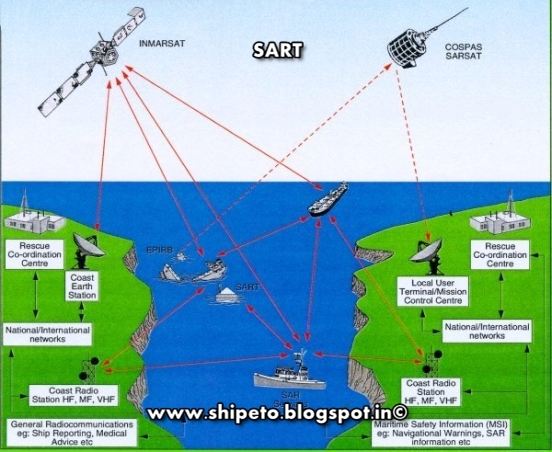 SART is taken out of bridge and kept in line of sight with radar scanner and put on test mode. We will get an audible alarm and visual indication on the SART and 12 concentric circles in the X band radar. 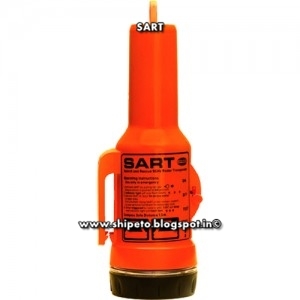 SART uses Lithium primary battery of 18v which gives standby time of 96 hours and operation time of 8 hours when activated/interrogated.